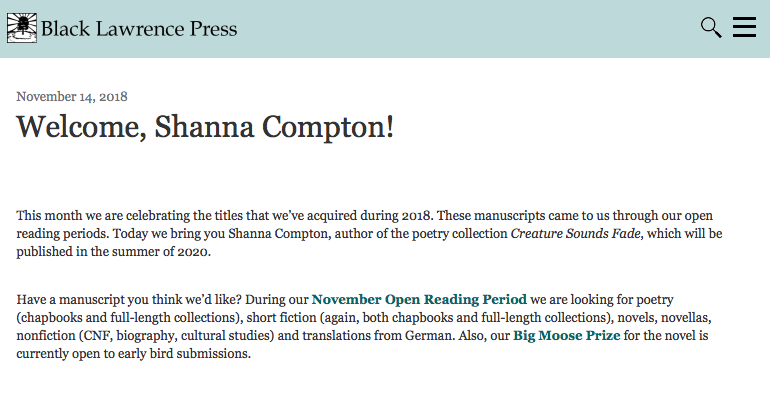 Shanna Compton is the author of Creature Sounds Fade (Black Lawrence, 2020), Brink (Bloof, 2013), For Girls &amp; Other Poems (Bloof, 2008), Down Spooky (Open Book Award Winner, Winnow, 2005), and several chapbooks. She's currently writing The Hazard Cycle, a book-length speculative poem. Her poetry and essays are widely published, appearing in Best American Poetry, the Nation, American Poetry Review, McSweeney’s, the Academy of American Poets Poem-a-Day series, and elsewhere. New poems have recently appeared in the Nation, the American Poetry Review, jubilat, and are forthcoming elsewhere. Creature Sounds Fade is scheduled to be published by by Black Lawrence Press in 2020, selected from their 2018 Open Reading Period.